Buddhism and Buddhist values were the pride of the Sinhale nation for over two millennia. Nothing that this country stood for brought international attention both from near and far than the nation’s commitment to safeguard and foster Buddhism. Buddhist values were the term of reference in national policy making by Sinhalese Kings. Even the Nayakkar (Tamil) Kings of the Kandyan Kingdom respected Buddhist values and never diluted them with ideas alien to Buddhism. Now all what this ancient nation stood for is under grave threat from a Government that is bound by Article 9 of the Constitution to give foremost place to Buddhism and accordingly to protect and foster the Buddha Sasana. The so – called ‘ Shared Values’ campaign publicized in Newspapers on Independence day (Feb. 4) is nothing but a shameless exercise to bury Buddhist values within a seemingly innocent move to harmonise values that are in-congruent. There is a world of difference between Buddhist values and values of Abrahamic religions. For example, the moral universe of Buddhism covers all living beings. Compassion is required of all Buddhists as a matter of faith to be shown to all sentient beings, human and non – human. No such moral obligation is required of Christians/Catholics and Muslims under their religious codes. The First Precept is very clear on this ethical conduct required of Buddhists. The principle ‘ Kill and Eat’ which is at the core of Abrahamic religions is anathema to Buddhist followers, by and large. Is the ‘ Shared Values’ policy meant to encourage Buddhists to ‘kill and eat’ and accordingly violate the First Precept? Sinhala Buddhists built this unique civilization that the rest of the world still admires. ‘Mahavansa’ the key historical chronicle was written by a Sinhala Buddhist monk Mahanama in the Anuradhapaura era (5th century AD). 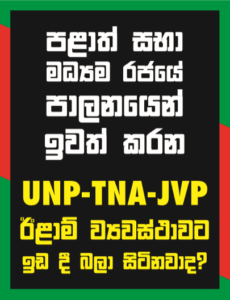 In order to promote a fake and bogus ‘ Multi – culturalism’ an idea that has no roots in our history or with any history, the contributions of the Sinhala Buddhists are being downsized and belittled, and our proud history misrepresented to accommodate others who never figured except perhaps as by standers. Ethnic problems created by Western Colonial Governments and Christian Missionaries who descended on ‘Sinhale’ like vultures to forcibly convert our people to their religions, cannot be solved by distorting history to allow these latter day arrivals to regain dominance and hegemony like in the good old days of colonial rule when the minority Christian religion was the state religion enjoying full state patronage of the colonial governments. The existential fears of the Sinhala Buddhists are legitimate given what has happened to former Buddhist countries such as Maldives, Indonesia, Bangladesh, Afghanistan, Pakistan and lately South Korea. The failure of current rulers of Sri Lanka to be sensitive to the existential fears of Sinhala Buddhists will be at their peril, politically speaking. Buddhist values must prevail over all other values. That is the eternal law of Sri Lanka.The fundamental duty of any ruler is to place Buddhism first and protect it. The Dasa Raja Dharma must be the fundamental basis of governance whatever party is democratically elected.